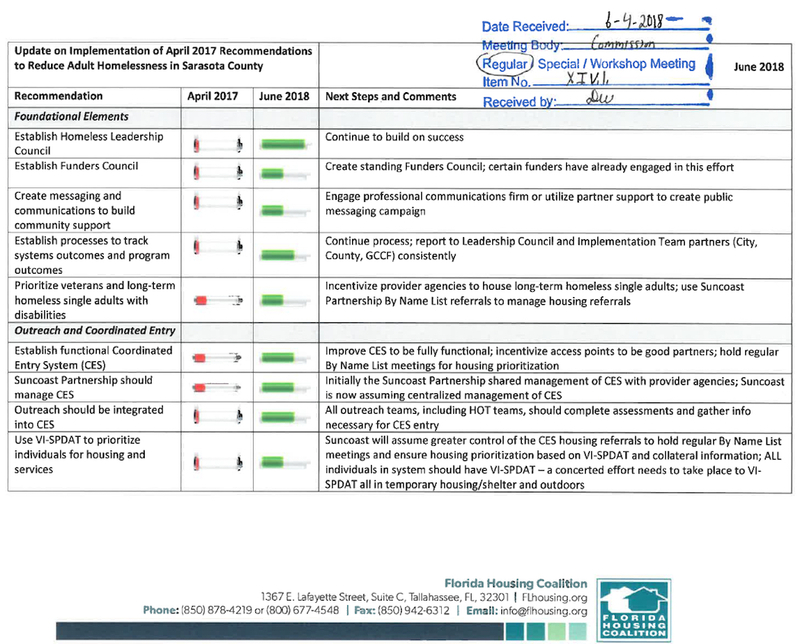 A little more than a year after both the Sarasota City and County commissions agreed to collaborate on a homelessness consultant’s recommendations for the community, the situation is much improved, city commissioners agreed this week. From February 1, 2017 through Feb. 28 of this year, 30% of the homeless individuals the Sarasota Police Department (SPD) Homeless Outreach Teams (HOTs) transported to The Salvation Army to sleep in beds the city contracts for there moved into permanent housing, Kevin Stiff, the city’s coordinator of homelessness response, reported to the City Commission on June 4. Another 9% of those the HOTs assisted achieved another type of “positive outcome,” Stiff said, which he defines as finding a place to sleep in the home of a family member or friend, or help through one of the treatment programs offered in the community. In his appearance before the commission, Stiff was accompanied by Susan Pourciau, the director of homeless training and technical assistance at the Florida Housing Coalition. She was the consultant the city hired last year to provide the recommendations that have been implemented in the city and the county. Edward DeMarco, CEO of the Suncoast Partnership to End Homelessness, and Lt. Richie Schwieterman, who has received national recognition for his work with the HOTs, also appeared before the board during its regular meeting this week. The February-to-February data, Stiff continued, showed that 486 individuals altogether stayed in the 20 beds the city maintains for HOT use at The Salvation Army. That resulted in a 77% average bed capacity, he noted. For the first quarter of this year, Stiff said, the teams made 2,013 contacts with individuals, while other social service agency case managers reported 250 contacts. The number of people transported by the SPD to The Salvation Army was 153, he said, and 84 of those chose to stay in one of the city beds. The utilization level of the HOT beds was 75% for the quarter, Stiff noted. Thirty percent of the homeless individuals found permanent housing or a “positive outcome” during the quarter, he added. Each Homeless Outreach Team has one officer and one case manager, he explained. The report he submitted to the commission said that each HOT conducts outreach to homeless persons on Tuesday, Wednesday and Thursday of every week. Representatives of social service organizations frequently participate in the effort, the report added. 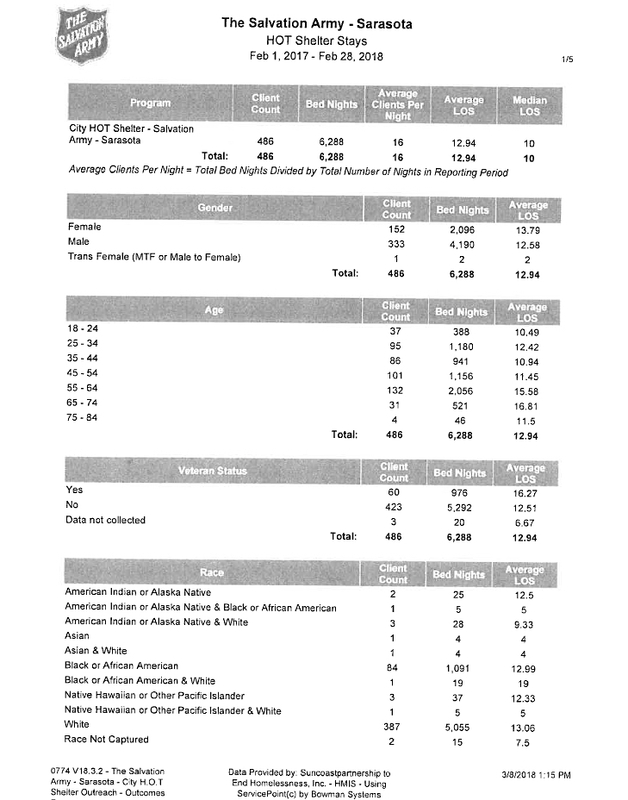 From Jan. 1 through March 31, 55 of the 84 people who stayed in the city beds were men, according to Salvation Army records included in the material provided to the City Commission. Twenty-three of those were between ages 55 and 64, with another 20 between ages 45 and 54, the data show. 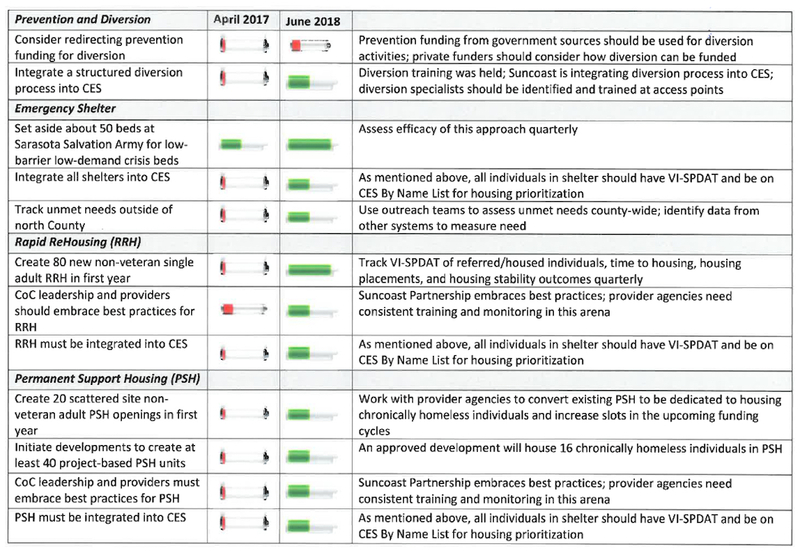 “There were a lot of challenges in the homelessness assistance system [in the community]” a year ago, Pourciau, the consultant, told the commissioners this week. Thanks to leadership of elected officials, the private sector and the Suncoast Partnership, she added, the system has begun to operate as it should. “There is an effective Leadership Council in place,” she said. The establishment of the latter group was one facet of her April 2017 recommendations. City Manager Tom Barwin offered special thanks to County Commissioner Paul Caragiulo for his faithful participation on that council, noting that Caragiulo served on the City Commission before his 2014 election to the county board. The Leadership Council comprises representatives of local governments, nonprofit organizations, the public and private sectors, and educational institutions. It works “to identify the focus for the Continuum of Care and assure, with the Suncoast Partnership, that strategies are developed to fill service gaps as they are identified,” as the Suncoast Partnership notes in its 2017 Annual Report. The Continuum of Care (CoC) is the group of agencies and organizations in Sarasota and Manatee counties that provide services for the homeless. The Suncoast Partnership oversees the CoC. 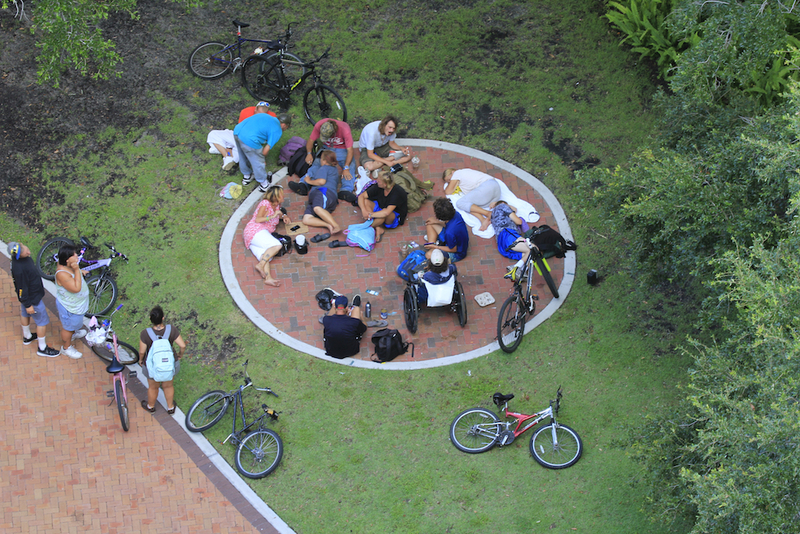 “We have in Sarasota now much greater capacity in the area of rapid re-housing, which is one of the best practices for helping people get rapidly out of homelessness,” Pourciau told the commissioners on June 4. More permanent housing will be made available soon, she added. DeMarco also explained that the Leadership Council set the goal of helping those persons who had been homeless the longest in the community find permanent housing. “And that’s hard,” he noted, because the system was set up to help those first who seemed most deserving of housing. “We didn’t have to say, ‘No,’” he added, because the people who have been homeless for the longest duration “just say, ‘No’ to themselves.” They are the least likely to take all the necessary steps “on their own,” he explained, to get off the street. It has been necessary “to change the mindset of the community” to ensure they get assistance, DeMarco pointed out. In the past, he said, the view was that people had to be “fixed” before they could go into housing. He explained that he was referring to resolving individuals’ alcohol and substance abuse issues, for example. Commissioner Shelli Freeland Eddie brought up an issue in which she had been involved and asked for ways to improve outcomes in such situations. About two months ago, she explained, a homeless person was sleeping outside her law office. She offered the person the opportunity to seek assistance through the HOTs, she said, and the person was agreeable. However, when the HOT members arrived, Freeland Eddie continued, they discovered the man had an outstanding warrant for public urination. Instead of the man getting a trip to The Salvation Army, she continued, he ended up spending two days in jail. That sends a message, she pointed out, that if someone has been in trouble with the law, the person should avoid seeking help to get off the street. However, he said, case managers will work to make sure a homeless person taken to jail will have a place to go when the person is released. Then DeMarco pointed to options for a person in a situation such as Freeland Eddie had described, without involving the HOTs. For example, he said, the person could go to the JFCS of the Suncoast facility on Fruitville Road in Sarasota or to The Salvation Army, where the person could be entered into the coordinated social service system established for Sarasota and Manatee counties. The person also would be able to get help, through that system, to deal with law enforcement issues, DeMarco added. When she asked about transportation to such facilities, he said he would provide her some information later. Lt. Schwieterman responded that flooding in some areas, because of the recent rainfall, and increasing numbers of mosquitoes had driven some of the homeless people out of camps where they normally live. In response to questions from Commissioner Hagen Brody, DeMarco said that data collected through the coordinated entry system had remained consistent for years in that 85% of the homeless in Sarasota County have been here a year. The transient rate remains at the 10% to 15% level, DeMarco added.